The Capers skate to a 12-2 victory against Gorham. Sophia Venditti had five goals and two assists Saturday as Cape Elizabeth/Waynflete/South Portland opened its girls’ hockey season with a 12-2 victory against Gorham/Bonny Eagle/Massabesic at Troubh Arena. Venditti’s first two goals provided all the scoring in the opening period. 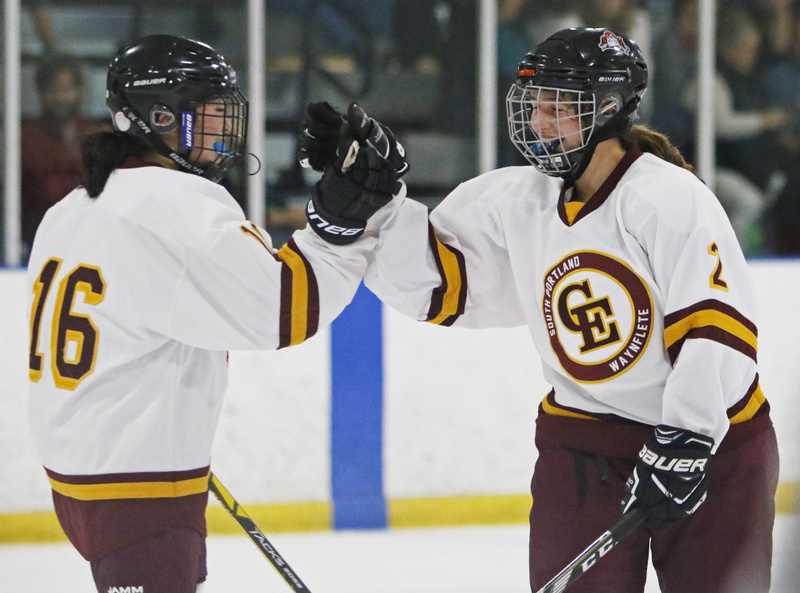 Cape Elizabeth used two goals from Nicoletta Coupe to outscore Gorham 6-1 during the middle period and essentially put the game away. Megan Polchies of Gorham handles the puck behind the net while Erika Miller of Cape Elizabeth pursues during the second period in Portland. Abbey Agrodnia recorded two goals and five assists for the Capers, while Coupe had two goals and two assists, and Koto Yamada one goal and three assists. Annie Guimond and Sophie Miller also scored for Cape. C.C. 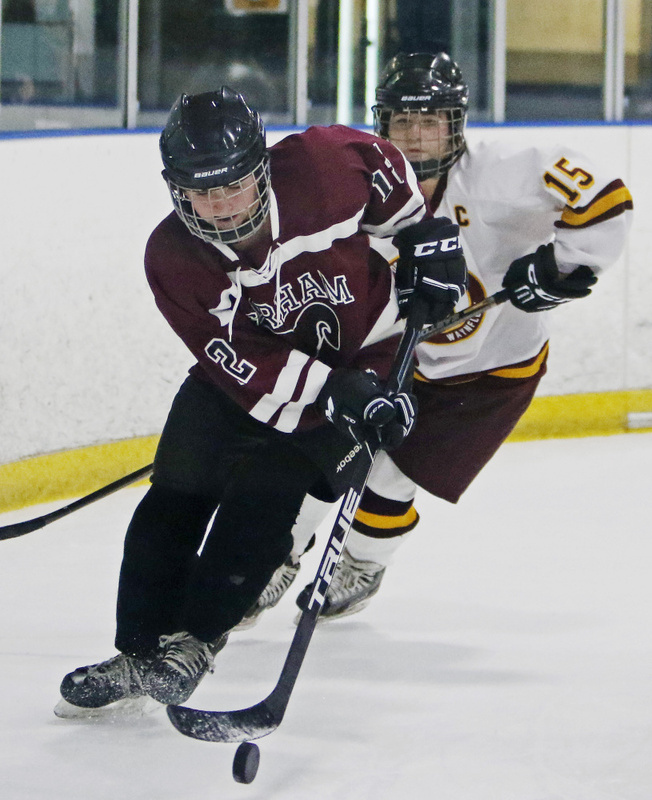 Cochran and Beth Goodrich each had a goal and an assist for the Rams. GREELY 5, SCARBOROUGH 1: Courtney Sullivan and Madison Pelletier scored 10 seconds apart late in the first period to give Greely/Gray-New Gloucester (1-0) a 2-1 lead over the Red Storm (0-1) at Falmouth. Courtney Brochu scored for Scarborough with 2:56 left in the first period but Sullivan tied it four seconds later. Greely pulled away with second-period goals from Bridget Roberts and Leah Walker before concluding the scoring on Nettie Cunningham’s goal with nine minutes left in the game. Sullivan and Kylie Rogers each had a pair of assists, and Jordan Owens stopped 14 shots for the Rangers. Grace Carriero had 12 saves for Scarborough. PORTLAND 9, BRUNSWICK 3: Emily Demers scored six goals to power Portland/Deering in a mutual opener at Portland. Caroline Lerch added a goal and two assists for Portland, and Maeve LeClair had a goal and an assist. Inez Braceras also scored for Portland. Beth Labbe had two goals for the Dragons and Elena Palmer added the other. CHEVERUS 6, FALMOUTH 0: Emma McCauley’s two goals bookended a five-goal first period as Cheverus/Kennebunk (1-0) took early control against Falmouth (0-1) at Portland. Caitlin Wolff and Zoe Mazur each had a goal and an assist in the first period, and Abbie Enck also scored. Abby Lamontagne set up two of the goals before scoring the only goal of the final two periods, off Madison Courtois’ second assist of the game.